NEW! The Winner of March Plantness 2019 is…CALIFORNIA POPPY!!!! Although our beautiful State Flower is the winner of this year’s March Plantness, let’s face it: these lovelies are all winners. Thanks for playing! We will be asking you to vote each week. For Round One, we have the Sprout Sixteen. Then it narrows again to the E-leaf Eight, then the Final Flora…and finally, the Championship Round. Which of our these lovelies win? Competition starts on Monday, March 25th. Good luck to all! Meet the competitors of March Madness 2019!! 'Dr. Hurd' Manzanita/ Arctostaphylos manzanita 'Dr. Hurd' is an evergreen hybrid shrub hailing from the sandy foothills of California. With glossy, light green foliage, brown-red bark and lovely multi-branched form, this garden tolerant (i.e. some summer water and richer soils) specimen provides robust structure to a native garden. It is also the fastest growing manzanita and hosts bell-shaped clumps of blooms that attract many pollinators with its delicious nectar. 'Anchor Bay’ Lilac/ Ceanothus gloriosus - This dense, low-spreading groundcover sports leathery, dark green, holly-like leaves with small but numerous bright blue flower clusters. Preferring a bit of shade and modest irrigation during the summer months, but tolerant of salt spray and resistant to deer browse, makes this perennial a favorite among mountain gardens. CA Fuchsia/ Epilobium canum is a favorite water-wise underdog groundcover perennial. This team is very proud of the wide variety of late summer/early fall bloom colors and delicate gray-green foliage. The prefer cool sun but tolerate part-shade or hot sun with moisture. California Buckwheat/ Eriogonum fasciculatum Native to California hillsides, this low growing and drought tolerant evergreen shrub requires little care. Displaying white flowers in spring, Buckwheat knows how to switch it up and change to pink in summer, then rust colored in fall. A prolific provider, the leaves, flower nectar and seeds of this plant are all important food sources for butterflies, pollinators and small birds. Western Red Bud / Cercis occidentalis This four-season interest deciduous shrub/small tree is a real winner in Bay Area climates. Tolerant of clay soils and a wide pH range. Providing full sun and some summer water will improve growth, while magenta flowers and young seed pods are edible! Wavyleaf Silktassel/ Garrya elliptica A shade tolerant and strong evergreen shrub/small tree with yellowish male catkins (tassels) 10 inches long that spring out in Feb-Apr. The catkins turn silvery as they age, providing a unique texture to any drought tolerant garden. Red flowering current/ Ribes sanguineum This deciduous shrub packs pendulous clusters of vivid, crimson flowers. Blue black berries are a favorite of birds. A more compact grower than most, and excellent as a hedge or in a mixed shrub border in native landscaping in cooler climates. Flannel Bush/ Fremontodendron This unique shrub/small tree displays wide velvety, deeply-five-lobed leaves sparsely covering the branches. But the real surprise comes when the lemon-yellow cup shaped flowers bloom in abundance from spring through summer. A good border plant for defending spaces due to slightly irritating fuzz (stellate hairs) on the leaves. Drought tolerant and water-wise! Deer Grass / Muhlenbergia rigens A striking bunch grass, this warm season California native is a favorite napping spot for local deer (hence the name). It’s long narrow grey-green leaves can stand 3 feet high with silver-gray flower panicles that stand 5 feet high. This extremely adaptable grass can take sun or shade, a bit of moisture or hot dry gardens, making it a hardy addition to most gardens. California Fescue / Festuca Califirnica This graceful, fountain-like native perennial grass can often be found in the understory of oaks and is great for slope stabilization. Planted as a specimen or massed for a striking meadow effect, this blue-green bunch grass features airy flower panicles that stand 1-3 feet above the foliage in late spring to early summer. This long-lived grass is even deer resistant! California Poppy / Eschscholzia californica Ah, California Poppy, has a more iconic wildflower ever existed?! A true star of Super Bloom 2019, it’s silky petals, ranging from deep golden orange to crisp yellow, stand bright against it’s feathery grey foliage. Grown best as an annual in full sun, but will tolerate part shade and can often be found in poor soils. A fitting symbol for the Golden State, this beauty was selected by a landslide as the state flower in 1890 and was made official in 1903 beating out Mariposa lily and the Matilija poppy! Coastal Bush Lupine / Lupinus Arboreus Also known as Yellow Bush Lupine, this rapidly growing 4-5 foot perennial bears striking 6” flower spikes that can range from blue to yellow. Hailing from coastal sage scrub communities, this aggressive seeder can sometimes be considered invasive so take caution when planting! Drought and wind tolerant, this valuable habitat plant can be an important shelter and food source for pollinators, butterflies and birds. Douglas Iris / Iris douglasiana A perfect addition to any rain garden, this attractive perennial wildflower spreads by underground rhizomes to create 2-3 foot wide clumps of arching, deep green evergreen leaves. Happiest when planted in light or afternoon shade in our warmer inland gardens, it will produce showy deep lavender-blue to near white flowers on 1-2 foot tall stalks in the spring. A showy addition to a meadow or that naturally wet area in your garden, this perennial is also an important nectar source for native bees! Bush Monkey Flower / Mimulus aurantiacus Also playfully know as sticky monkey-flower due to its slightly tacky leave, this orange to yellow flowering perennial is a real trooper and needs no supplemental water once established but can be coaxed into repeat bloom if given occasional summer watering. 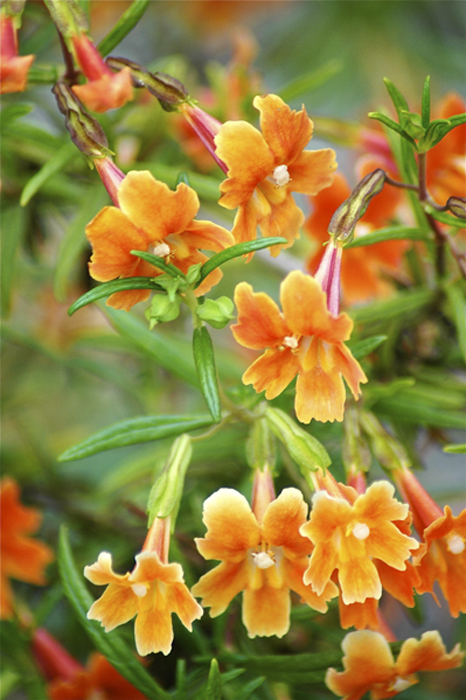 A favorite of hummingbirds but disliked by deer, monkey flower can grow to about 3-4 feet tall and does best in full sun to part shade. Hummingbird Sage / Salvia spathacea As the name suggests, hummingbirds are particularly attracted to the bright, tubular whorls of deep rose-pink flowers held 1-2 feet above the low growing arrow shaped foliage of this herbaceous perennial groundcover. This extremely tough plant can fill that often hard to satisfy dry shade spot in the garden that many gardeners are perplexed by. A natural oak understory plant, deadheading spent flowers can keep this perennial looking low and tidy year round. Foothill Penstemon / Penstemon heterophylus Uniquely endemic to California, this showy perennial is an excellent addition to any dry garden. It’s hard not to notice the 3 foot flower spikes boasting brightly colored trumpet shaped flowers that may be shades of blue or purple to nearly magenta. Naturally ranging from grasslands to chaparral to forests, it is highly adaptable to the urban garden.